We’ve written before about some super parents who wanted their children with disabilities to be able to relate to the characters they saw in comics, TV, movies, etc. Recently, however, another touching story came to the attention of us here at PCU, and we thought we would share it with you guys. It just happens to be a bonus that the end product looks incredible. 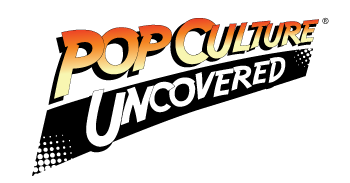 What is a parent to do, when they wonder if they will ever be able to share a love of comic books with their child, because there aren’t really any characters in comicdom to whom the child may be able to relate? Well, just ask Chip Reece. Reece has remarked that his son Ollie, who was born with Down syndrome, is a happy kid, and the two share a great relationship. Sure, Chip is concerned about his son’s future, as parents are wont to be (especially parents of kids with disabilities). He of course wants Ollie to understand that anything is possible in this life, and that Ollie’s dreams are no less important and achievable as any other child’s on this planet. Since Ollie’s birth, Chip Reece has mused on whether or not he would be able to share his love of comic books and the amazing worlds they contain with his young boy. So, using his incredible artistic talent, he set out to create something that was not only inclusive, but beautifully drawn and written. In an email he sent to website Upworthy.com, Reece gives his reasoning for embarking on the endeavor. “I wanted Ollie to see that people with Down syndrome could be superheroes too”, he remarked. While Reece isn’t a storyteller or artist, he pulled from elements of Ollie’s real life in order to design a comic that would reflect his love for his son, and show off a deep love and passion for comic books. The result, is a visually arresting book called Metaphase – the story of which follows a young boy (who happens to share the same name as Chip Reece’s young son), and his dad. In the book, Ollie’s dad has supernatural powers which almost mirror those of Spider-Man. The character of young Ollie really looks up to his super-powered father, and wants to follow in his footsteps to save the world. However, dad sees a possible hiccup with this plan, as he grows concerned about what may happen to his boy while going up against some super-baddies. As most children do, Ollie gets impatient with his father’s helicopter parenting as he grows older. He doesn’t like that dad won’t include him in the adventures he has in being a superhero, and grows frustrated with the world telling him that he’ll be limited in his options as a member of society. So, what does a child who feels left out of the superhero game do when the chips are down? Well, find a shadowy corporation who claims to be able to give anyone superpowers and ask them for help, that’s what. All it’ll take is a bit of genetic shenanigans. What could wrong…right? 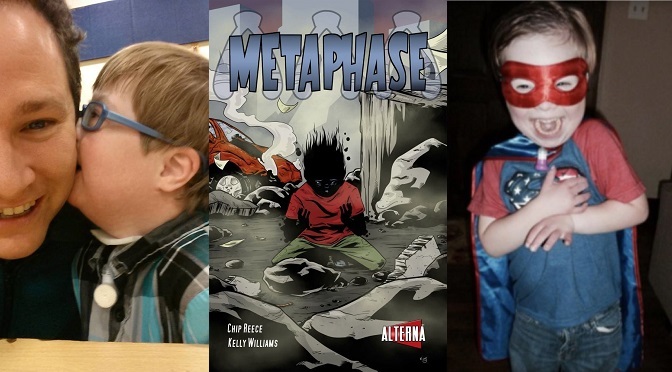 Published by Alterna Comics, and with artwork by Kelley Williams, and writing by Peter Simeti and Chip Reece himself, Metaphase is a sorely needed bit of inclusivity in the comic book world. When Alterna Comics contacted Reece after hearing about Metaphase, they asked if they could flesh out the story. Reece, who works as a social worker, wasn’t sure that he could afford the process; but he agreed anyway. He began a Kickstarter campaign in 2014, and it quickly raised more than $9600 to fund the book’s publishing. Hundreds of copies were printed, and Metaphase was released in 2015 on Amazon. As of November 17, 2017, almost 1500 copies of the book have been sold, and it has even made Ollie a bit of a local celebrity at his school. In an interview with CBS News, Chip Reece remarked, “He’s had kids come up to him at school yelling, ‘It’s the superhero kid!’ It’s pretty cool. I love that it has given people a reason to approach him”. Chip Reece is currently thinking about the sequel to Metaphase, and hopes to begin full time work on it in the summer of 2018. With Ollie now in second grade, Reece plans to incorporate his son’s big personality into the character. “He’s a very happy kid. He’s funny. He can’t say things, but I can tell. He is a prankster, which might be because of me,” Reece quips. Remember, dear readers. The Metaphase journey began because of one parent’s love of their child, and a wish to see more inclusivity in comic books. As we recently told the audience at a diversity panel at Baltimore Comic Con in 2017, “Write Your Own Story”. You never know what kind of result you’ll be able to achieve unless you try. If you’d like to read our full review of Metaphase, check it out here.